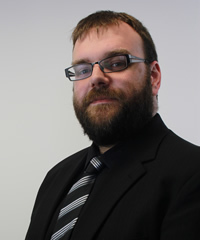 Llyr is a member of the non-contentious department, heading up the Commercial, Charity and Ecclesiastical Law Team. Llyr deals with all aspects of Commercial work, including pure company work and commercial property, and has a niche specialisms in Charity Law and Ecclesiastical Law. Llyr was appointed Diocesan Registrar and Legal Secretary to the Bishop of St Asaph in March 2011, becoming the youngest person to hold that post in the history of the Church of Wales, and being one of only six people in Wales to hold such a position. Llyr bolstered his specialism by completing the Master of Laws in Canon Law (LLM(Canon)) a through the University of Cardiff, qualifying in April 2014. Llyr joined Swayne Johnson Solicitors as a trainee solicitor in June 2004, qualifying in 2006. Llyr became a Director of the firm in October 2012. In his spare time, Llyr is the Company Secretary of the North Wales International Music Festival (NWIMF) and Denbigh Museum, and is also a Trustee of the St Asaph Community Association and Gladstone’s Library, Hawarden – the only Prime Ministerial library in the United Kingdom, and one of only a few residential libraries in the world. Llyr also a keen musician, having sung with the St Asaph Cathedral Choir for some 30 years, and continuing to sing with a chamber choir in the south Manchester area, where he currently lives.